The life of living in Bondi can be challenging. With busy schedules, appointments and social obligations to meet, it often becomes the case that our homes or apartments end up unfortunately neglected. While many Bondi locals can relate to this common scenario, at Simply Maid we believe you should never have to feel the need to compromise on the things that really matter in life. At Simply Maid, our team of trusted and experienced residential house cleaners are on a mission to make cleaning as enjoyable and simple as possible, and that’s the way it should be. We offer professional cleaning services all throughout Bondi and all its surrounding suburbs. We like to think of ourselves as Bondi's very own residential household cleaning superheroes, arriving just at the right time to sort out even the messiest of homes and apartment blocks. Book a Bondi home service in just 60 seconds! With Simply Maid's professional home cleaning services, we promise you will never have a reason to look anywhere else. We offer fortnightly, weekly and monthly residential cleaning to Bondi properties of all shapes and sizes. We regular clean houses, apartments, townhouses, duplexes and even provide individual room cleans. No matter what your case may be, we you’re your cleaning covered. Our home Bondi cleaning services are designed to ensure we take the workload out of your busy schedule and make your house cleaning an absolute breeze. Our straight-to-the-point booking system is designed to align with our beliefs about providing a simple and hassle-free clean. In just under 60 seconds you can safely and securely book a clean for your home and then simply sit back and relax while we do take care of the rest. It’s really that easy. Cleaning is our game and your experience with us is our prize. Book a clean with us today and we'll make sure all your cleaning worries are a thing of the past. Let us show our cleaning difference today, book a clean with us say goodbye to your messy home once and for all. At Simply Maid, we provide a simple and hassle-free cleaning service for your Bondi home. Enjoy an effective cleaning service from a down-to-earth, friendly cleaning team who strive to achieve perfection with each and every clean. Not only do we service Bondi, we also specialise in servicing all it’s surrounding suburbs including Bondi Junction, Coogee, Bronte, Maroubra, Waverley, Tamarama, Rose Bay, Eastern Suburbs, Double Bay, Vaucluse, Bellevue Hill and Woollahra. Other suburbs we service around Sydney include: Mosman, Gladesville, Hurstville, Double Bay, Waterloo, Northern Beaches, and Chatswood. For a great residential clean in Bondi or any of its surrounding suburbs, call Simply Maid today or simply making a booking with us online. 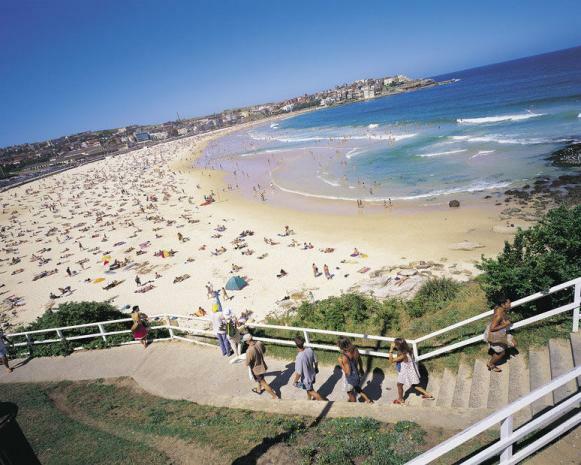 Bondi is home to the famous Bondi Beach – one the the most visited tourist attractions in Australia. Bondi is located closely to the heart of Sydney’s CBD and is originally an Aboriginal word meaning water breaking over rocks. Surrounding suburbs include Bellevue Hill, Rose Bay, North Bondi, Bondi Junction, Tamarama, Bronte and Dover Heights. There is a little over 10,000 local residents living in Bondi today. The suburb has grown immensely popular in the the past decade and has hosted many sports and recreation events, festivals and has even featured its very own television lifeguard series, Bondi Rescue. Bondi’s restaurants and local shops have also made it prominent destination to visit. Restaurants such as the Bondi Beach Icebergs dining room, Hurricanes and the local fish and chips gives many visitors just another reason to come back.